UPDATE: Order SOON, some items featured below are LOW STOCK. Also consider Expedited Shipping to get your order before the weekend! To get just about everything you need to make 60 of these cards*, including shipping (and the exorbitant tax in my area), it'll cost you around $60! The merchandise itself will come in just over $50, so you'll also get to pick (1) FREE Sale-a-Bration item of your choice, PLUS you'll have tons of patterned paper left over. And for every additional 20 cards you want to make, simply grab another package of Crumb Cake Notecards & Envelopes for $6. *Adhesive and Clear blocks not included in price estimate. For the cards below, I recommend Clear Blocks in C, G, and H sizes. For the interchangeable sayings, you may want multiple G blocks to avoid the hassle of unmounting and remounting different sayings in a group setting. 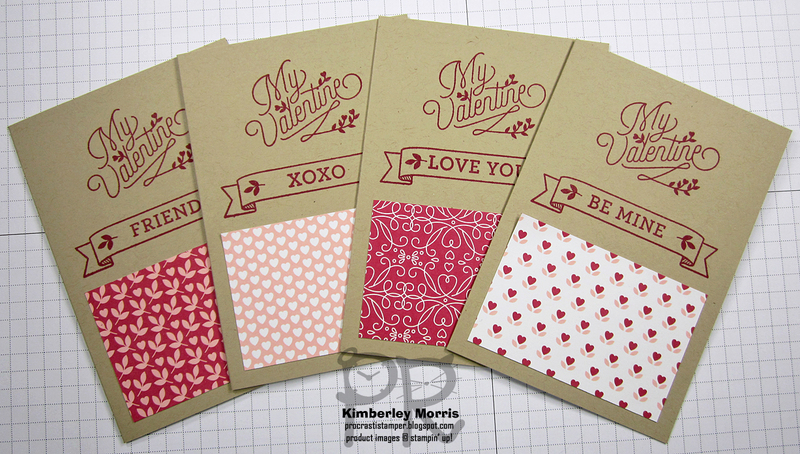 Also consider Block A to add a heart image to envelopes! The Love Blossoms Designer Series Paper Stack is 6" x 6", and the piece used on each card measures 2" x 3", so you can cut exactly 6 pieces from each sheet. With 48 sheets in the stack, this means you can get 288 of these cards from one stack! This would make a super inexpensive project for anyone, but especially convenient for classrooms, nursing homes, adult care facilities, etc. The notecards are already cut to size and scored, they come with coordinating envelopes, and they are USPS mailable. The only prep work would be cutting each of the patterned paper sheets to 2" x 3". When you are choosing your Sale-a-Bration FREE item, keep in mind that three of the choices are only available through February 15th: Perfectly Artistic Designer Series Paper, Sky is the Limit stamp set (available in Wood-Mount or Cling Foam), and Hello stamp set (available in Wood-Mount or Cling Foam). Either of the stamp sets will work great with the Crumb Cake Notecards & Envelopes, especially if you grab the Basic Black Archival ink pad (and Reinker) to use with them. See the Limited Time Sale-a-Bration items together, with project ideas, in this PDF. TIP: when choosing stamp sets as Sale-a-Bration FREE items, I tend to choose the Wood-Mount option when it is available...that way I can loan it out or sell it later, and the blocks are included! 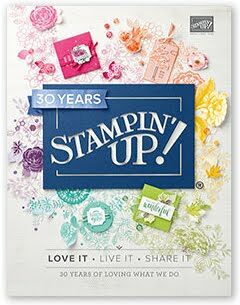 Stampin' Supplies: Bloomin' Love Photopolymer stamp set, Love Blossoms Designer Series Paper Stack, Rose Red ink pad, Rose Red reinker, Crumb Cake Notecards & Envelopes (20 per pkg), Clear Blocks: C G and H, SNAIL Adhesive (and Refill), Stampin' Trimmer. Find more SUPPLIES in my ONLINE STORE!